As promised in last Sunday's Link to Love post, I've successfully completed an arm knitting project. Now that I've done it, I would say that arm knitting's relationship to traditional knitting is similar to finger painting's relationship to fine art. Both are capable of producing lovely results, one is just a lot more precise than the other. Arm knitting and traditional knitting utilize the same general principles -- casting on, binding off, etcetera -- but arm knitting is inherently freeform; it simply can't be as exact as traditional knitting. The size of a knitter's arms varies greatly from person to person, and even on a single knitter's arm the forearm is usually quite a bit wider than the wrist, so it's nearly impossible to make sure all the stitches are identically sized. However, each stitch is so large that the final result is incredibly malleable and all the stitches shift and even each other out once the project is complete. Also, the process of arm knitting feels much more like moving loops from side to side than winding yarn in specific ways to create perfect stitches as you do in traditional knitting; it still feels like you're working with yarn, just in a very different way. Having said that, I have become a fan of this inexact science, and I'm excited to share my arm knitted Triplet Shawl with you. I learned the basics from a Michael's youtube video, Arm Knitting for Beginners, which was straightforward and quite helpful. It covers how to cast on, make the basic arm knitting stitch, and how to bind off. If you've never arm knitted before, I highly recommend watching that video before you move on to attempting the pattern below. 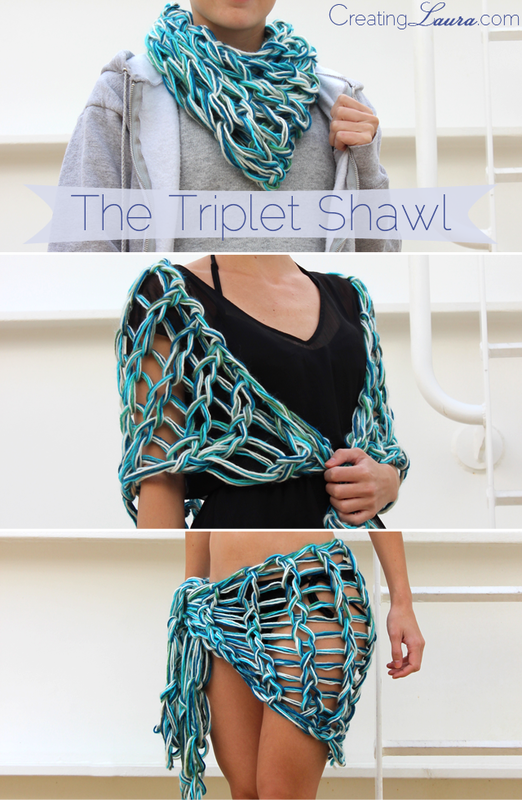 Keeping all that in mind, here's the pattern for the Triplet Shawl! 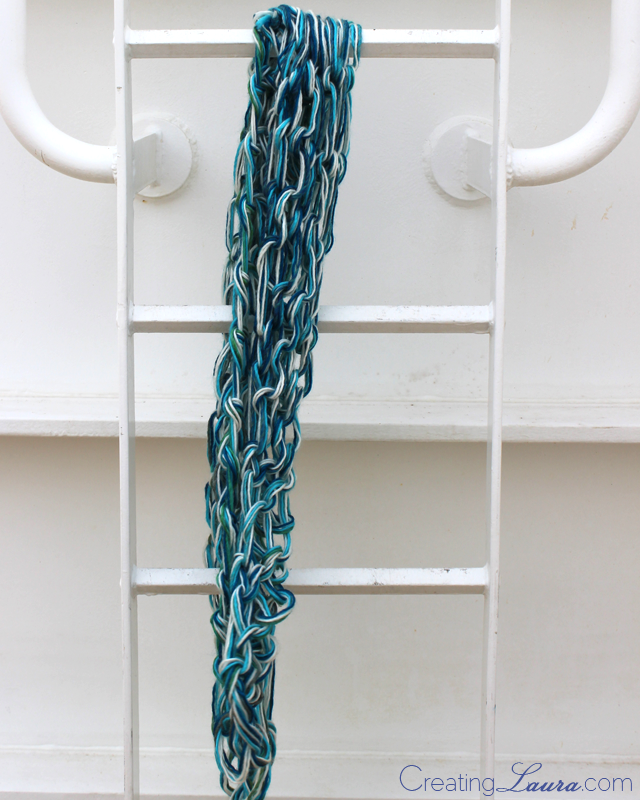 Cast on 28 stitches, using all 5 strands of yarn together as if they were 1 strand. Repeat row 2 for the next 11 rows until there are only 4 stitches remaining. 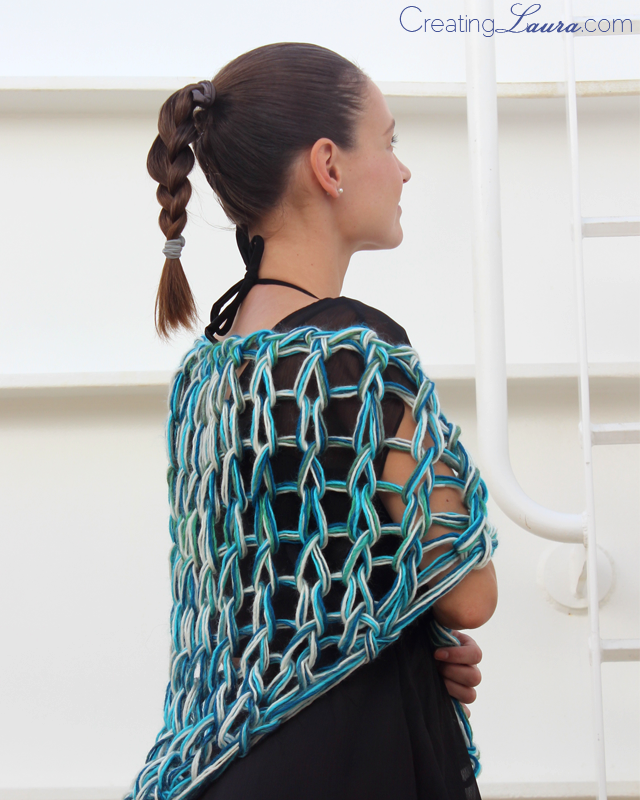 Weave in the ends and try on your new shawl! You can throw it over your shoulders to wear it as a shawl, wrap it around your waist to use it as a swimsuit cover-up, or fold it in half and tie it at the back of your neck to create a bandana scarf. And did I mention that it took me less than 30 minutes to make this? 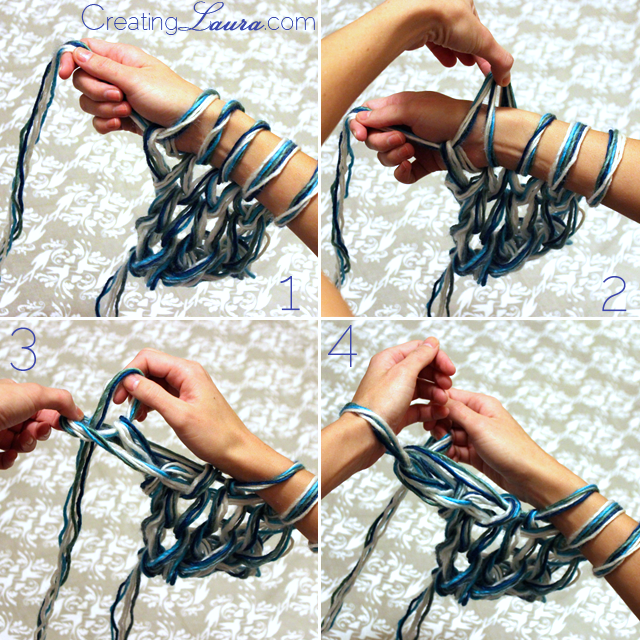 Arm knitting is amazing if you're in the mood for some instant gratification. 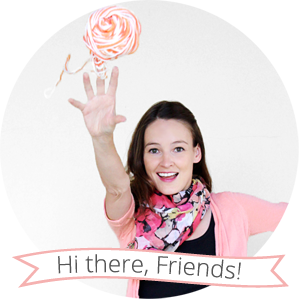 Hi Michelle, I didn't make a video, but do you know how to knit with needles? If so, arm knitting two stitches together is exactly the same as knitting two stitches together with needles. Just do the same exact thing you would do to knit one stitch except pull two stitches off your arm at once instead of just one stitch. hi, great job! i like the triangle shape you made. have you figured out a way to make another type of stitch? like the knit and purl in traditional knitting. Nope, so far I've only figured out the basic arm knitting stitch and how to arm knit two stitches together. Can you tell me the brand/name & colors of yarn you used? Love it!! I love this! 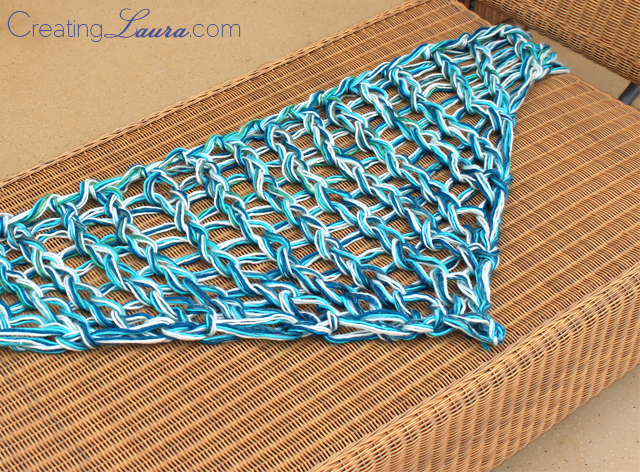 I made a chunky open weave triangle shaped crochet shawl similar to this recently and I bet arm knitting it would have been so much faster. Love the choice of colors too, very beachy! Is this made of 5 skeins of each color?